Invesco is today celebrating the two-decade history of one of the largest and oldest ETFs to hit the market, the Invesco QQQ ETF (NASDAQ: QQQ). The Invesco QQQ ETF first hit the markets on March 10, 1999 and has provided a long-standing contribution to investors and provided many with exposure to some of the most innovative companies to rise up over the years. After 20 years, QQQ is now the sixth largest U.S.-listed ETF with $66.4 billion in assets under management, was the second most traded ETF in the U.S. based on average daily volume as of the end of 2018 and boasts one of the longest performance histories available for an ETF. “Invesco is proud of the 20 years of innovation that have been marshaled through the Invesco QQQ and the access it has provided investors to pioneering companies that impact each of us daily. Through products, such as QQQ, Invesco continues to focus on creating tools to help investors build portfolios that exceed expectations. We look forward to the next 20 years,” Dan Draper, Managing Director, Global Head of Invesco ETFs, said in a note. QQQ tries to reflect the performance of the widely observed Nasdaq-100 Index, which includes 100 of the largest domestic and international nonfinancial companies listed on the Nasdaq Stock Market based on market capitalization. 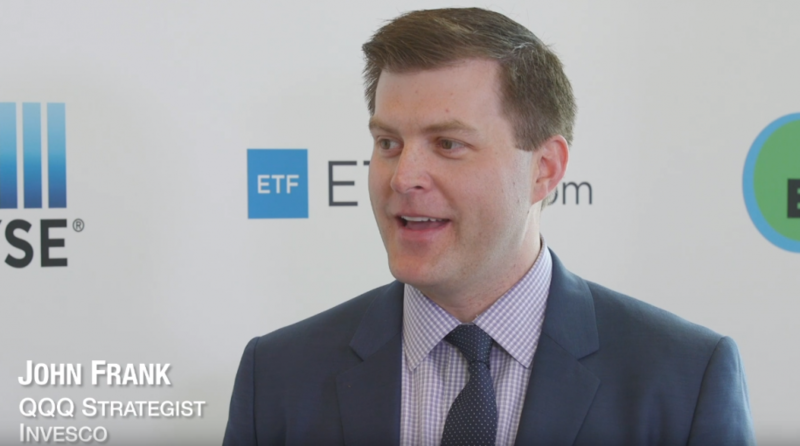 “A lot of investors think it’s just technology, and actually, today, it’s about 40% technology and 60% other sectors, so we really look at it as large-cap growth and has a lot of the biggest innovators that we know in the economy today,” John Frank, QQQ Strategist for Invesco, said at the Inside ETFs Conference.